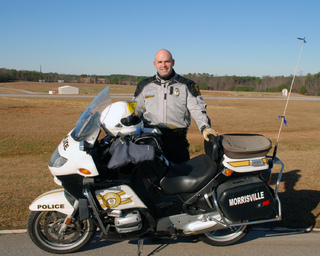 I have been law enforcement since 1994 and been on our Motor unit since 2004. I came from Raleigh P.D. to Morrisville P.D. in 2002. I'm a certified driving instructor, FTO and radar operator. I have been riding motorcycles since the early 1980's, starting off with dirt bikes and then on to street bikes in the late 80's. I entered in several off road races when I was in my teen's called hair scrambles in the N.C. mountains and now I club race with WERA in the southeast division. I also still ride on the street with my personal bike which is a R1200GS. I enjoy riding cross country and have been across the U.S. numerous times. I average 30 to 50 thousand miles a year on a motorcycle including my on-duty riding.